Thanks to their great price/performance, we consider the Canon EOS 200D and the Nikon D3500 to be among the best choices if you’re a beginner with a limited budget. Read on to see our field notes, an evaluation of their pluses and minuses, and recommendations for good lenses. How Should You Choose Your First DSLR? 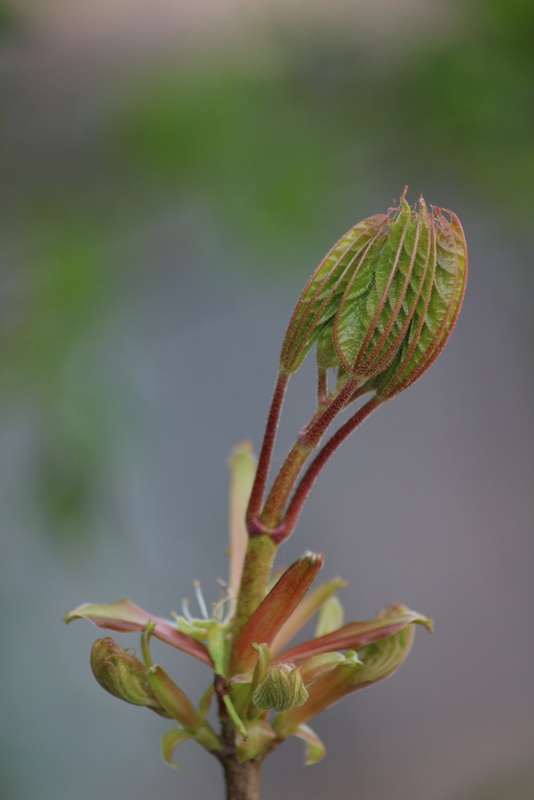 When I first started taking pictures, I chose a Canon EOS 100D, the predecessor of today’s EOS 200D. Both models were the smallest and lightest DSLR with an APS-C sensor at the time of their release. The long side of both of them is about as long as two matchboxes, making for a very compact helper for capturing experiences wherever I need it. Also, the hybrid APS-C CMOS AF II sensor with an 18 megapixel resolution that was in the 100D was the top of the line among affordable cameras in 2013–2014. Today’s 200D does even better here. It’s got 24.2 megapixels, and its DIGIC 7 image sensor also offers the benefit of very quick focusing in live view. Its optical viewfinder with nine-point automatic focusing makes photography easier too. This is a superb feature for things like filming videos. You can even film in Full HD. The three-inch touch screen is also a nice touch. It makes your work easier not only when taking pictures and setting the camera up, but also for example when editing videos inside the camera. Unlike the 100D, the “200” has a folding display, and so you don’t have to lay on the ground when taking pictures of low-lying objects. When I got started in photography a few years back, I was looking for the “ideal combo.” A DSLR and lens combo that would be both affordable and usable in a variety of situations. My choice went to the Canon 100D, and its younger brother the 200D will serve you equally well today. It’s a very reliable, well-designed little gadget with lots of features. Where it excels—with a few small minuses—is the compactness that I’ve already mentioned. Its dimensions mean your arms won’t hurt after a full day of photography, and it won’t take much space in your bag either. So you’ll be able to pack equipment that would otherwise be too heavy or wouldn’t even fit. 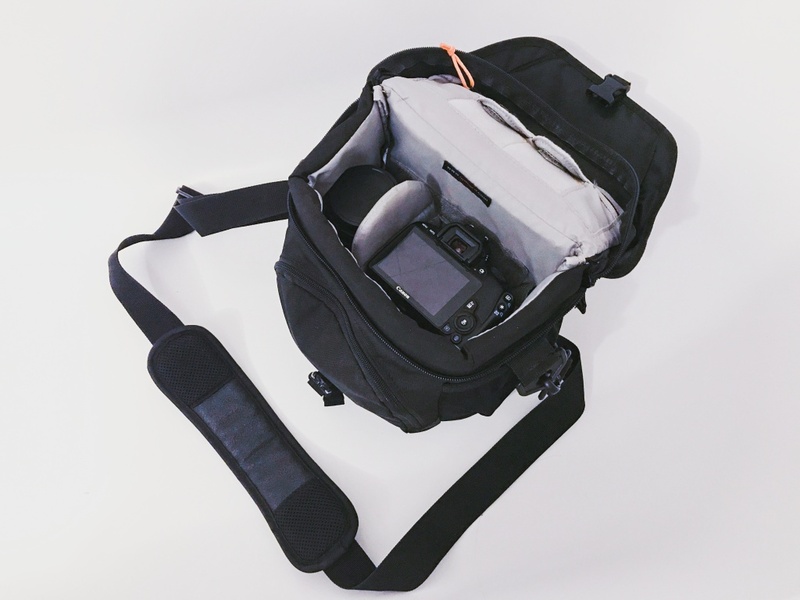 A Lowepro DSLR bag and its accessories. However, the small size also causes the first of the problems shared by both the 100D and the 200D. If your palms are large, you’ll likely have trouble holding them when you’re taking pictures or filming videos. The overall grip is very pleasant, and they come complete with an ergonomic curvature around the trigger and rubber-protected parts, but the recess for your fingers is small, and their small profile means you’ll have to make do without a firm all-fingers grip. 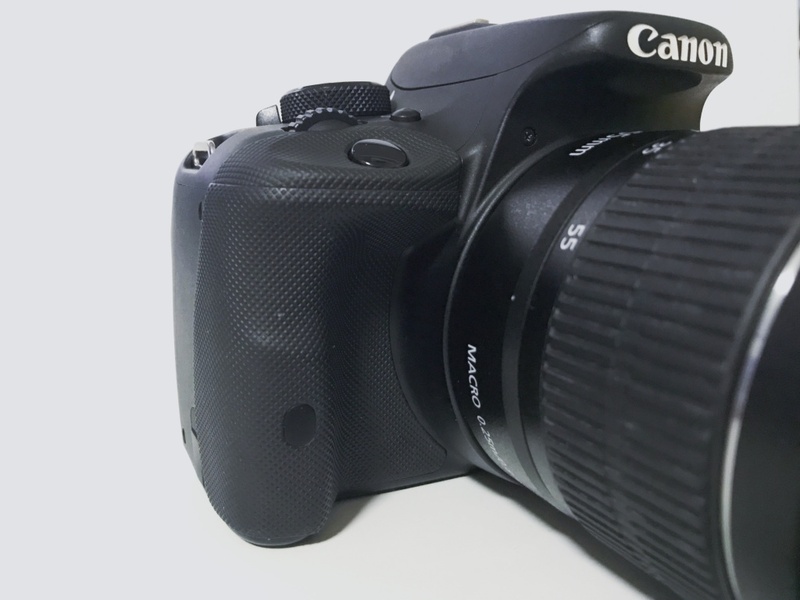 The ergonomic rubber-coated molding on my Canon EOS 100D. I’ve been greatly enjoying the shape of this grip for years. Naturally you’ll need a lens too. When the 100D was brought to market, it could be bought in a set at a discounted price, where you got the camera and one or two lenses to go with it, and potentially other accessories like a cleaning pen or a memory card too. Today you can choose from among similar sets of lenses alongside the Canon 200D. In my case it was the universal Canon EF-S 18-55mm f/3.5-5.6 lens and a “long” Tamron AF 70-300mm f/4.5-6 Di LD Macro 1:2 lens. And I would recommend these same lenses for you. They’re affordable and universal, and until you start wanting to move up to higher price and performance categories, they definitely won’t let you down no matter what the situation. I would also recommend a fixed portrait lens. 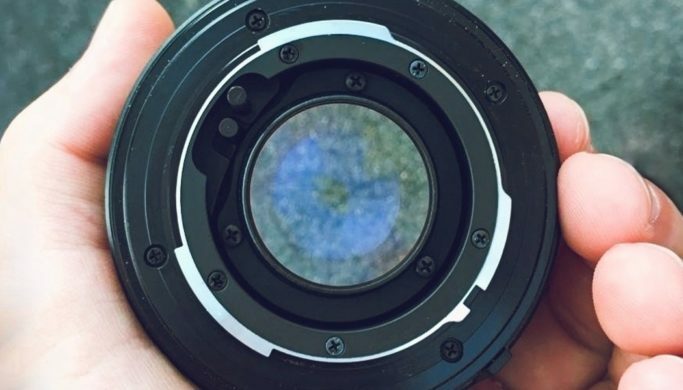 This kind of lens is the best for portraits thanks to its low f-number. Just keep in mind that it’s fixed—it doesn’t zoom. 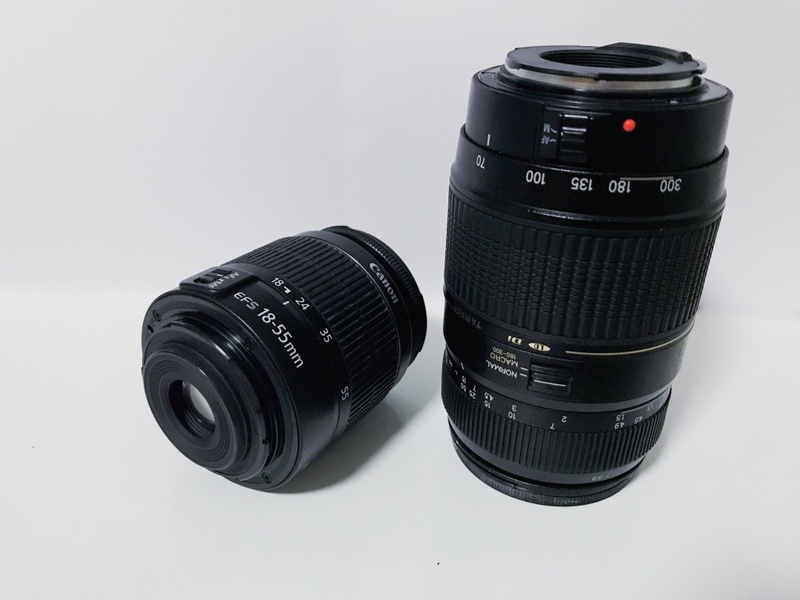 A 50 mm f/1.8 STM is a great choice within this category. Canon and Tamron lenses from the basic set. I have to note that if you plan to take pictures for example while you’re out walking and develop them immediately, you’ll run into a problem. 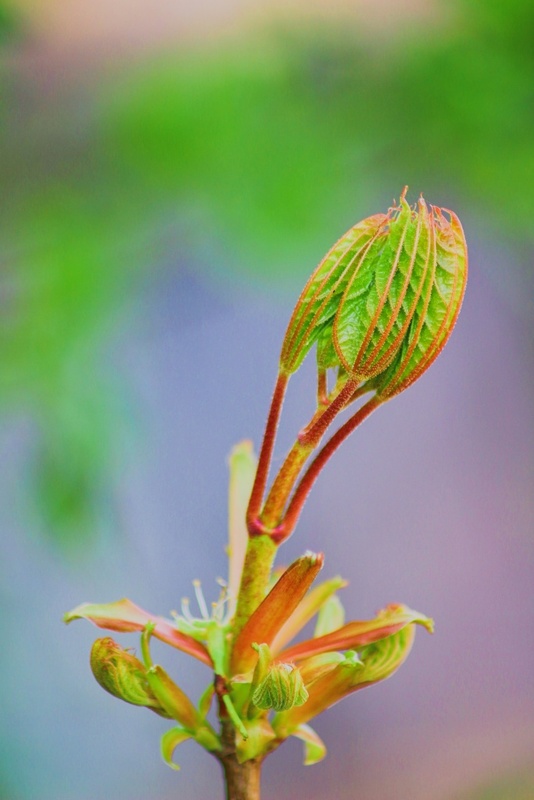 While a DSLR will get you sharp, detailed pictures, the colors won’t be exactly right. Compared to when you’re shooting with a phone they’ll be less vivid, and so it’s good to edit your pictures afterwards. So unless you’re using a filter, if you want to get the most out of every picture, you should count on needing to spend a lot of time editing your pictures after taking them. Now, don’t think of this as absolutely needing to spend hours making lots of edits in demanding photo software to get photos that are even bearable. You can get faithful pictures with lovely colors in a program like Zoner Photo Studio X, which I’ve had the best experience with for photo editing. A few minutes in the Develop module will be enough to ensure your pictures are full of dazzling colors. I have no complaints about the video capture on both the 100D and the 200D. All you’ll have trouble with is, once again, these cameras’ small size. Because they’re so light, they’re not especially stable. To film smoothly without tremors, you’ll have to pick up a lens with image stabilization, or reach straight for a tripod for static scenes. Last but not least, though, let’s not forget that you’ll need a memory card with a write speed of at least 10 Mb/s to shoot video. With slower speeds, video capture can end up stopping automatically after 5–10 minutes because the card can’t keep up. Here I’ll be acquainting you with the accessories that can completely transform how it feels to work with your DSLR. Let’s start with the most important part: the battery. 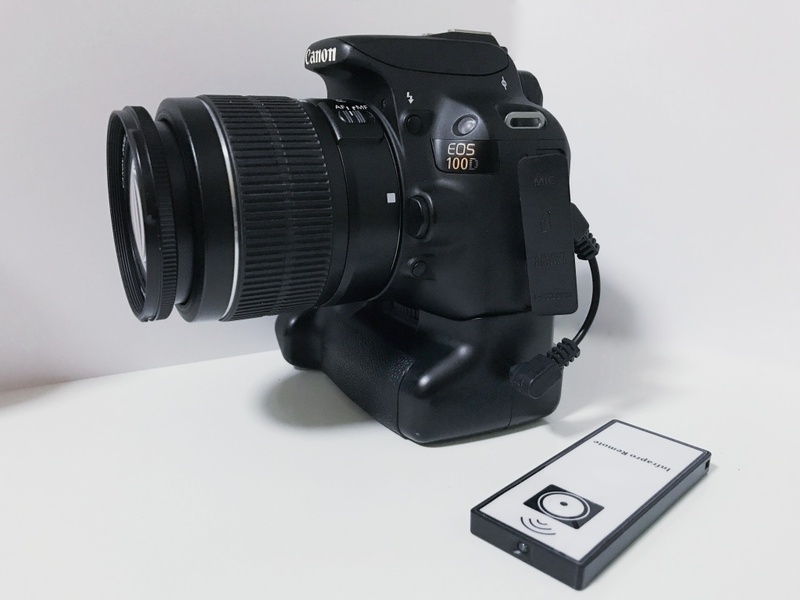 The original LP-E17 battery supplied with the Canon EOS 200D only has 1,040 mAh, and so it won’t last all day. So unless you only want to film family celebrations with about 20 minutes of video, you’ll have to pick up either a battery with a larger capacity (DSTE makes batteries with capacities of 2,300 mAh and up, for example) or a battery grip. A battery grip add-in can hold up to two cells inside, thereby drastically increasing how long you can shoot. It can take you from 20 minutes up to easily 6 hours of non-stop filming. What’s more, though: it fills up the space beneath the camera and lets you shoot in portrait orientation more easily by improving your grip; in short, it makes up for the camera’s structural flaws. Here’s how my 100D looked with the above-mentioned mod. You can also see the remote control and, on the side, a wire connecting the bottom trigger with the camera system. You can pick up a Canon EOS 200D in a single-lens set for about $550. If you choose a two-lens set, it shouldn’t run you more than about $750. The 100D is no longer officially sold, neither separately nor in kits, but you can still find it in second-hands. However, I strongly recommend that you prioritize official dealers. If you’re aiming higher straight from the start, you can pick up a Canon EOS 4000D for example, or its spiritual rival the Nikon D3500, or the higher D5600 model. In the next part of this series, we’ll show you what camera + lens set works best for photographing landscapes. You can look forward to tips and tricks that will make your work easier.